A report published on Monday by the Atlantic Council, the Brookings Institution, and the Chicago Council on Global Affairs that calls for the US to supply Ukraine with arms has generated a lot of discussion on both sides of the Atlantic. Image from the Rapid Trident 2014 training exercise which took place in Ukraine during September 2014 and involved troops from Ukraine, NATO members and other states. Written by eight high ranking former US diplomats, defence and military personnel – Ivo Daalder, Michele Flournoy, John Herbst, Jan Lodal, Steven Pifer, James Stavridis, Strobe Talbott and Charles Wald – the report called for the supply by the USA of military equipment to Ukraine. Most of the equipment suggested is ‘non-lethal’, namely: radar that would identify the location of artillery being fired; secure communications equipment; unmanned aerial vehicles (UAVs or drones) designed for reconnaissance; electronic jamming equipment to counter enemy UAVs; armoured Humvee vehicles; and medical equipment. In addition the report also called for Ukraine to be supplied with lethal weapons, in particular “light anti-armor missiles” (presumably fired from a light vehicle or by a small crew) which would be intended to counter Russian or Separatist attacks using tanks and armoured personnel carriers. The recommendation that the USA supply that equipment has garnered some criticism. For example, Jeremy Shapiro, also of Brookings, has among others argued against US transfers to Ukriane as doing so would provoke a greater response by Russia and so escalate the fighting. With one exception that concern is misplaced. 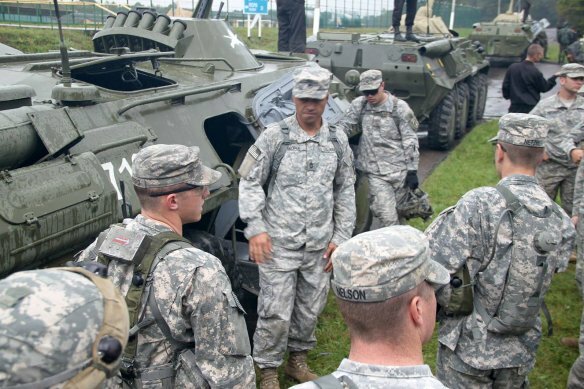 According to administration officials the USA spent USD 118 million in 2014 on providing Ukraine with training and ‘non-lethal’ military equipment including counter mortar radars, radios, body armour and night vision equipment. The first batch of three radars arrived in November. Moreover the US Senate has already passed a bill authorizing the provision of military aid, including lethal weapons, worth USD 350 million. So if the supply of military equipment by the USA to Ukraine were to prompt Russia to escalate the war, then we have already crossed that threshold. What the USA has yet to do is supply Ukraine with weapons such as anti-tank missiles. German Chancellor Angela Merkel has stated that Germany won’t provide weapons to Ukraine as she is “convinced that this conflict cannot be solved militarily.” Chancellor Merkel is probably correct. About a third of wars end with an absolute military victory by one side or another; but under the current state of play the war in Ukraine is unlikely to be one of them. Ukraine can’t win a military victory. Since August, every time Ukranian armed forces have won battlefield success and gained more territory, Russia has poured in more and more men and weapons and reversed the situation. Ukraine isn’t fighting two small separatist republics. It is fighting Russia, and Russia will continue to have much stronger military forces. Russia and the separatists can hold and expand their territory; but they can’t achieve a war-ending military victory over Ukraine. President Putin boasted that his armed forces could “take Kiev in two weeks”. But even if he could the war wouldn’t stop there. Ukraine under Russian occupation would surely feature a continuing anti-Russian insurgency. What is taking place in Eastern Ukraine is a war of attrition. Each side is trying to fight until the other sues for peace through exhaustion. What little research there is suggests that arms supplies by sponsor states can have a significant effect upon a conflict when they are provided to non-state actors that have difficulty in obtaining arms any other way. But supplies to Ukraine are likely to have a much less dramatic effect. First, Ukraine isn’t under embargo and as a sovereign state it can buy arms from any country that will grant an export license. It was recently reported that Poland is willing to sell Ukraine weapons, and Russia recently objected to a proposed sale of almost EUR 5 million worth of ammunition to Ukraine by Bosnia and Herzegovina. When more data is available it will likely show that other supplies to Ukraine have already taken place. Second, Ukraine inherited large quantities of military equipment from the Soviet Union, and more importantly a large chunk of the Soviet military industries. Over 2009-13 Ukraine was ranked by SIPRI as being the eighth largest arms exporter in the world. Over the long run, Ukraine is capable of making its own weapons, though it does lack key technologies (such as for secure radio communications). Arms supplies from abroad are much less important than for a state or non-state group that lacks its own military industry (such as current supplies to the Kurdish forces fighting in Iraq or Syria). The United States and NATO should seek to create a situation in which the Kremlin considers the option of further military action in or against Ukraine too costly to pursue. The combination of closing off that option plus the cumulative impact of Western economic sanctions could produce conditions in which Moscow decides to negotiate a genuine settlement that allows Ukraine to reestablish full sovereignty over Donetsk and Luhansk. The war isn’t going to end until at least one of Russia or Ukraine decide that the costs of fighting are too great and they sue for peace. In providing technology that Ukraine lacks, the arms supplies proposed by Daalder et al would make for a modest enhancement of Ukraine’s ability to inflict upon Russia and the separatists losses of people and material. To a certain extent the supplies are already happening, and the provision of anti-tank missiles would not in its self be a ‘game changer’. Supply by the USA and others of large quantities of major conventional weapon systems – particularly artillery – would be likely to increase the intensity of the fighting, but that wasn’t suggested. As with any supply of weapons into a war zone, there is a risk that any equipment supplied could proliferate out of Ukraine or be obtained by non-state groups in the region (though the risk of proliferation of supplies to the Ukrainian armed forces is likely to be much less than recent supplies to forces fighting in Iraq and Syria). What is likely to be far more significant in such a war of attrition are the economic sanctions imposed upon Russia and economic aid provided to Ukraine. Calls to provide Ukriane with enough financing to cope with an economy deep in recession and burdened with greatly increased military expenditure are likely to have a greater long term significance than the suggestion of arms supplies made by Daalder et al. There are plenty of examples of powerful states that withdrew from wars against weaker enemies because the fight wasn’t worth the cost (the Soviet withdrawal from Afghanistan comes to mind). But such disengagement after a war of attrition by Russia or even Ukraine will likely take many years. What we don’t know is how important the war in Ukraine is to President Putin and to Russia in general (it is clearly important to the population of Ukraine and its leadership) – it is yet to be seen how much they are willing to sacrifice. The death toll from the war in Ukraine “now exceeds 5,358 and another 12,235 have been wounded”. A war of attrition that carries on for years will likely kill many more.